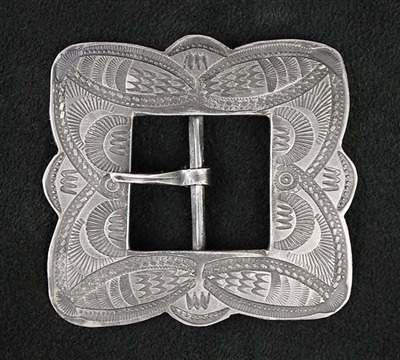 This amazing buckle is being attributed to the work of master artist Ike Wilson. The age and overall detail lends itself to an artist that not only had access to detailed stamps but also was able to apply them to a piece of silver with a well-balanced design. 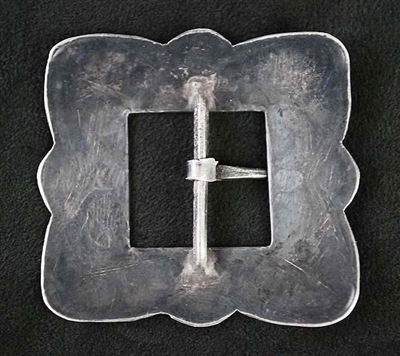 This buckle is quite small, but makes a powerful statement as to the ability of one man’s talent from an earlier era. It measures 1 5/8” by 1 9/16” and fits a 11/16" belt. Can also be placed on a leather purse or hat as adornment or framed as a work of art. A beautiful heavy patina graces the entire piece. Not hallmarked. Ike Wilson was one of the legendary C.G. Wallace, Navajo silversmiths that created silver pieces for the Zuni lapidary artists. 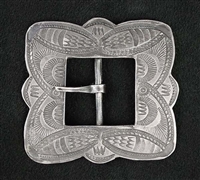 He also crafted traditional Navajo and sometime ornate silver pieces for Mr. Wallace. He was a master of design with his creative stamp work proving to be exceptional. Ike passed away in 1942, but left a legacy of his fine detailed work for many to admire.